Do the weak deserve to be bullied? Of course not. But do the weak tend to be bullied? Yes they do. See the difference between the two ways the question is framed? The way a question is framed spells the difference between the two answers. Persistent victim mentality: Filipino activist slogans haven’t changed much over the last half-century. Bullying is wrong and people should stand up to bullying. But to stand up to bullying, one needs to be strong. Weak people are less capable of standing up to bullying. As such, weak people need help to stand up to bullies. Strong people, for their part, help whenever and however they can. It’s the right thing to do. What is wrong, however, is when the weak regard that help as an entitlement. It’s like crossing the street. Nobody deserves to be run over by a truck while crossing a street. But people get run over nonetheless. Each person is responsible for mitigating the risk of being run over by learning how to cross a street properly. The fact is, there are consequences to being weak. Those consequences are felt by weak people whether they choose to be weak or can’t help being weak. It does not matter whether it is one’s fault that one is weak or not. The only relevant fact here is that being weak attracts consequences. In short, you need to become strong to overcome bullies in a sustainable and independent manner. Remain weak and you will likely continue to be bullied. That’s really all there is to it. The trouble with some “liberal-minded” Filipinos is that they only see one side of the equation. Bullies are bad and the bullied are “victims”. When you get addicted to your own victimhood, you lose any will to strive to become strong. Indeed, the Philippines is a macrocosm of that attitude. Because Filipinos collectively see themselves as victims, they have lost the will to develop an inherent capability to defend their own interests. Instead, Filipinos rely on their “allies” to defend their interests. This is the reason why the Philippines’ armed forces are the weakest in the region — because Filipinos believe help is an entitlement. The world does not work that way, however. The history of the world is penned with the blood of people defeated in battle. Liberal democracy dominates the planet today because men built and flew big airplanes into Germany and Japan to carpet-bomb industrial centres and nuke two cities. The royal houses in Great Britain are descended from ancient northmen who drove indigenous Britons to the corners of the isles in Scotland, Wales, and Ireland. The great federations of America and Australia were built on lands seized from the chieftains of ancient native “nations”. Even the Philippines is ruled by an imperial government in southern Luzon shaped by Tagalog tribes to the detriment of island tribes at the outer rim of an empire whose capital is in a city called Manila. Were the defeated indigenous peoples entitled to help when they were being massacred? Perhaps. But the fact is, there was none such help to avail of at the time. Whether or not they believed they were entitled to help at the time would not have, well, helped them either way. This is the problem in the way certain Filipino liberals think. They build an entire edifice of “anti-bullying” ideology on the back of the notion that “help” is an entitlement and always available. Filipinos’ ingrained sense of entitlement to “help” manifests itself across the board. 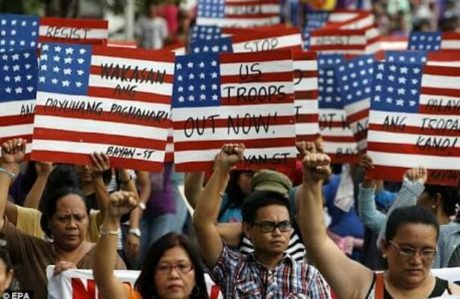 Its most embarrassing form, beyond a pathetic dependence on the United States for defence, is in the way certain “activists” invite foreigners — entire governments, the UN, and corporate media businesses even — to meddle in domestic issues that Filipinos should really be sorting out amongst themselves. “Extrajudicial killings” (EJKs), for example, have been turned into slogan fodder by some “thought leaders” for soliciting the sympathy of the foreign media and certain “rapporteurs” to support their efforts to undermine and even topple the government of President Rodrigo Duterte. What flies way above their pointed heads is the reality that resolving allegations of EJKs is a domestic problem. Filipinos see this as a challenge because, some say, the Philippines’ democratic institutions are “not strong enough”. But, suffice to say, no amount of foreign intervention can strengthen Philippine “democracy”. That is a task Filipinos need to step up to without help from the outside and be accountable for. The fact is, history is written by victorious bullies. This is a lesson Filipinos need to seriously learn. The Philippines, in fact, is the only major Western-aligned liberal democracy that lacks a potent enough killer instinct to join other liberal democracies in Europe, North America, East Asia, and the Indian subcontinent in a healthy arms race. Even Germany and Japan who had overcompensated for the guilt of starting World War II by hard-coding pacifism into their national charters are starting to re-evaluate their global roles. When it comes down to it, a country can only count on its own military capability to defend its interests. For that matter, Filipinos can only count on their inherent strength and cleverness to resolve their domestic issues. That they seem to be unable to likely says something about the existence (or non-existence) of those normally-inherent virtues in their national character. And that is probably the reason why Filipinos are in chronic need of help. If we allowed, insurgencies, rebellions of all kinds, banditry, etc… to happen in our country…we deserve them…because, we refuse to fight and defeat these people. We deserve these evils; because most of us don’t care ! hmm. Thought-provoking article Benign0, but I think you’re mainly illustrating the Filipino ambivalence towards ‘help’, which (in my opinion) springs from a fundamental misunderstanding of what ‘help’ even IS. What you are saying goes against my – ‘humble’ – view/vison that I have of the Philippines. A collectivisitc society/culture (Utang na loob). And my pinay GF expresses and shows those characteristics to the extreme. Or maybe I mis-interpret your entire ‘defense’. @marius, yes you did expand the principles involved significantly here. Filipinos’ confused regard for help, cooperation, and collaboration coupled with the low-trust character of their society makes this a more complex issue to tackle. I think the key with the “meddling” thing is that Filipinos need to learn how to learn from the help or “meddling” extended to them by outsiders in time of need. If no lessons are learned, such as what happens everytime Filipinos learn and build nothing after disaster strikes and foreign relief aid comes through to fill the gaps in resources and capability, there can be no progress. @Robert: I wasn’t really “defending” anything, just making some observations. As Benign0 correctly pointed out, a house divided against itself will fall. benign0: I suppose there are three sorts of “meddling”. 1) There’s what we might call Christian charity: empathy with human suffering, and the desire to reduce it. Hence (say) shipments of clothes and food … which are promptly stolen, or wasted, because they offend the Filipino sense of Pride. As I’m sure you know, there’s a law that prevents foreigners from giving clothes to Filipinos. It is perfectly legal, of course, for a well-placed Filipino official to steal said clothes and SELL them to (destitute) Filipinos. Foreigners learn quite quickly. There’s likely to be a lot less of that sort of charity next time around. 2) Advice, from NGOs, missionaries and the like. Sometimes these people are clueless. I remember a story about a missionary who air-freighted (at enormous expense) a set of chemical toilets to some flyblown African village. You can imagine what they looked like six weeks later. 1) “This is how we do it in the Philippines”. 2) “You’re a foreigner, who do you think you are telling us what to do?”. 3) “Get out of our country if you don’t like it”. You will meet this reaction almost NOWHERE else on the planet. If you go to another country with an idea, people will evaluate it critically, and if it’s a useful idea, they’ll use it. They’ll try to UNDERSTAND the idea and adapt it to local conditions – as you said elsewhere, technology and ideas don’t always transplant well. Here’s the key: it’s often a two-way process. The people who introduce the idea are able to work with the locals to make the original idea BETTER, and the receiving culture may have OTHER ideas they can give back. An example would be rail transport: the basic concept has many variations, and each variation was often perfected (or initiated) in one particular country. Only in the Philippines do you get outright rejection of any possible help on the basis that “you’re a foreigner, it’s none of your business”. This is not strength: it’s misplaced arrogance, and it results (as you pointed out) in disrespect and bullying from outsiders. Oh … number (3) would be interference from the World Bank, IMF, etc. Well, don’t think you’re unusual in that respect. Those organisations cause mayhem all over the place, including in “rich” countries. Bullying is deep in the pinoy non-culture. As parents are not educated and edicational system is roted from lazyness and corruption kids are not either. Look on your roads at time of school day end. Kids are making fun, literally moking every one. looks like the numbers of maute’s is getting bigger. they started with 30 and now how many dead more than a hundred now. now it’s down to 80 according to the latest news. seems there’s some groups reinforcing the maute’s. it’s not discrimination to identify pilipino muslims. it’s to catch terrorist. we also want to have ID with blood samples and fingerprints on file. no id no service period. Just Benign0’s way of saying, playing the victim card to get “help” or hand-outs, is wrong… and makes the person (or country) doing it even weaker. Nothing uttered is more true and more depressing.